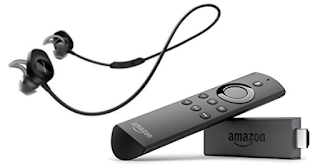 Purchase a new, 1 user, 1 year Silver Subscription before February 15, 2017 and we will send you an Amazon Fire TV Stick with Alexa - just enter the promo code FIRETV17 on the shopping cart page. Once you complete the order please email us with your name, and the address where you want us to ship the Fire TV Stick. Make it a new, 5 user Silver Subscription license or any other combination of licenses with a total value of $800 or more and we will send you a Bose Sound Sport Wireless Headphones in black, aqua or citron color - just enter promo code SOUNDSPORT17 on the shopping cart page. Once you complete the order please email us with your name, your color choice, and the address where you want us to ship the Bose SoundSport headphones. Available to US and Canadian residents only. Limit 1 per customer. Expires on January 31, 2017.